SKU: WOODRENEW-1GAL. Categories: Green Restoration Products, Perma-Chink, Wood Cleaners. Tags: deck cleaner, Log Cleaner, wood cleaner, wood cleaning concentrate. Wood ReNew is a biodegradable percarbonate-based concentrated wood cleaner that treats water stains and cleans/brightens grayed and weathered wood. Wood ReNew contains a thickener that helps it adhere to log walls and siding. It is the preferred product for use with Perma-Chink Systems finishes. Wood ReNew will also help remove, when needed, old worn Perma-Chink Systems exterior finishes. 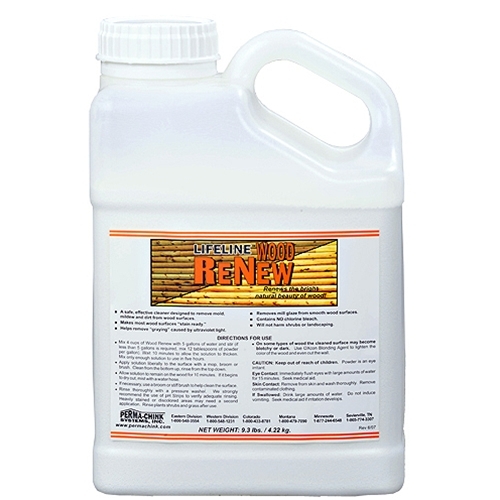 One gallon Wood ReNew makes 20 gallons of solution and cleans approximately 3,000 sq. ft.
Four ( 4 ) cups mixed with 5 gallons water cleans approximately 750 sq. ft. If less than 5 gallons is needed, mix 12 tablespoons of powder per gallon. Mix only enough solution to use in five hours. Never allow to dry on walls. Wood ReNew should only be used with Lifeline Exterior, Lifeline Ultra 2 or Lifeline Ultra 7. Not recommended for use with other wood finishes. On some types of wood the cleaned surface may become blotchy or dark. Use Log Wash™ to lighten the color of the wood and even out the wall. Mix product. Wait 10 minutes to allow the solution to thicken. Apply liberally from the bottom up. Allow solution to remain on the wood for 10 minutes. If it begins to dry out, mist with a water hose. If necessary, use a broom or stiff brush to help clean the surface. Rinse from top down thoroughly with a pressure washer. Heavily stained or discolored areas may need a second application. Rinse plants shrubs and grass after use. We strongly recommend the use of pH Strips to verify adequate rinsing. CAUTION: Keep out of reach of children. Powder is an eye irritant. Eye Contact: Immediately flush eyes with large amounts of water for 15 minutes. Seek medical aid. Skin Contact: Remove from skin and wash thoroughly. Remove contaminated clothing. If Swallowed: Drink large amounts of water. Do not induce vomiting. Seek medical aid if irritation develops. Wood Renew is available for shipment via FedEx Ground Service to all 50 states. For international shipments, please contact customer support at 888-208-2248. Be the first to review “Wood Renew Log Cleaning Concentrate” Click here to cancel reply.